This article tries to make sense of this logic by connecting each successive Agni missile to the felt need and technological challenge that prevailed at that point in time. The author has had the opportunity to be associated first hand with the Prithvi and Agni programmes. That said, the assessments made in this article are the personal views of the author. These have no official endorsement or authority. 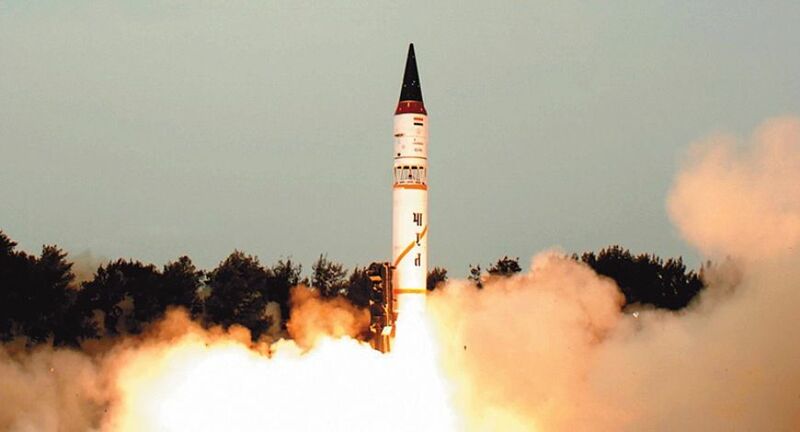 When the Integrated Guided Missile Development Programme (IGMDP) of the Ministry of Defence (MoD) for research and development of a comprehensive range of missiles, namely Prithvi, Trishul, Akash and Nag, was started by the Defence Research and Development Organisation (DRDO), Agni was conceived only as a Technology Demonstrator (TD). Technology demonstrator by definition, is a prototype version of a conceivable product of a future system which is aimed to prove a concept or a new technology. This was exactly the status of the first version of Agni. How? Way before the second nuclear tests in 1998 when the IGMDP got started in 1982-83, the stakeholders knew it well that for carrying our warheads (both conventional or nuclear), to longer ranges in the land of the potential adversaries, re-entry technology was an essential requirement. Re-entry in the context of ballistic missiles, relates to the end portion of a cycle which starts by missiles going out of the earth's atmosphere (exo atmospheric) during accent flight ( post boost phase), traversing most of their flight paths (mid course phase) in the exo-atmospheric region, flying on a a sub orbital trajectory before finally making a "re-entry" into the earth's atmosphere (100 km/53.9 nautical miles) for striking their intended targets ( terminal phase). Since ballistic missiles are not powered all the way like for example, the cruise missiles, specific advantages are gained in pushing such missiles out of the earth's atmosphere for most of their flight paths. Firstly, during their flights outside the earth's atmosphere, longer ranges can be achieved since no energy is wasted in overcoming air resistance, and secondly, and as a consequence, comparatively very high velocities can be achieved using the same propellant (boost) charge. These velocities could be of the order of 5000m/s or thereabout. Such tremendous velocities enable the ballistic missiles to cover long distances in very short periods of time. This increases their lethality and effectiveness, as such missiles give minimal reaction time to the defenders to employ counter measures. For instance an intercontinental ballistic missile (ICBM) can cover a range of 10,000 km in a matter of say, 30-35 minutes. The big challenge arrives at the moment of re-entry, when owing to the atmospheric drag due to air resistance impacting on the missiles, temperatures of the order of 30000 C/54320F are reached. These temperatures that can totally disintegrate the re-entry vehicle. In addition, there are a host of other technological challenges at the time of re-entry related to gas flows, accuracies and more ( these are not discussed here). Since longer ranges for delivery vehicles were operationally required as an essential component of our deterrence strategy, harnessing the re-entry technology was the starting aim of embarking on the Agni journey. It is also relevant to mention here, that Agni was the only ballistic missiles out of the ones being developed under the IGMDP. Others were either surface-to-surface or surface-to-air or anti-tank missiles. The period that elapsed between 1982-83 to about 1988 saw Project Agni take its baby steps gradually maturing into its first success. The expertise brought in by the IGMDP Project Director Dr APJ Abdul Kalam from the Satellite Launch Vehicle (SLV) -3 programme was the starting block. As stated, while the basic requirement to provide the delivery means for the carriage of conventional or nuclear warheads into the domain of our potential adversaries remained fundamental to the development of the Agni (and Prithvi) series, the question was to progressively achieve such range and altitude capabilities that made our strategic deterrent credible and effective in the perception of our adversaries. In the timeframe between 1982 -88, the first of the Agni series (Agni II) was developed starting from the basic design developed in the TD version. The missile had a range capability of 2500-3500 km. The range consideration was obviously driven by the range to be effective in the gut of the adversary's vulnerabilities. Also pertinent to mention here is the fact, that around the same time, Pakistan successfully test fired its Ghauri Missile (Ghauri I range 1500 km, Ghauri II range 1800 km) capable of reaching India's rear areas. The first successful test of Agni II on 11 Apr 1999 achieved a range of 2000-2100 km. There were two specific target requirements in this very first development. First was the requirement to keep the missile rail and road mobile so as to keep it quickly moveable/deployable (15 minutes) essentially as a measure of survivability against adversary's first strike. Secondly, was the technological challenge to harness the re-entry technology as explained above. Both were successfully achieved. It is to be noted that the approximate time frame of maturing of Agni II also coincided with the Indian nuclear tests of 1998, supposedly making the nuclear boosted fission weapon available[i],[ii]. The re-entry vehicle (RV) of Agni II was designed to carry this warhead. As time would roll another 7-10 years (say around 1995) and lighter nuclear warheads (thermonuclear weapon payloads) would be made available , Agni II would see another technological escalation ushering a new Agni RV Mk II . Since the warhead would be lighter, there would be a room to pack liquid fuel into the pressurised vessels of the RV making it manoeuvrable thus ushering the cutting edge manoeuvrable re-entry vehicles or MaRV for short. Such RVs could be programmed to be manoeuvred to their target. MaRV was a major milestone achievement. The conventional RV is a passive ballistic load whose accuracy is dependent on the accuracy of its parent missile's insertion into the exo-atmospheric sub-orbital trajectory. MaRV on the other hand, can be manoeuvred to its intended target with its own propellant steam, thus improving its accuracy manifold, and also, making it unpredictable. Getting back to 1998-99, a major setback happened. Soon after the nuclear tests of 1998, the Missile Technology Control Regime (MTCR) a then alliance of Group of Seven (G7) nations established in 1987 (Canada, France, Germany, Italy, Japan, UK and USA, now 35 member strong) imposed a technology denial regime on India preventing it to import missile related technologies[iii]. This actually proved to be a blessing in disguise since all systems and sub-systems were then to be home grown; an uphill task but a sure route to developing indigenous capability (read pride). As the turn of event unfolded around a year or so, India got engulfed in the Kargil War. Besides everything else that happened in the said war, an operational need was felt to have a warhead carrying capability that could cover a huge gap between Prithvi II ( 250 km) and Agni II ( 2500 Km) missiles both of which stood developed by ten.